With its sapphire waters and white-sand beaches, Jamaica is one of the most romantic locations on earth. So it’s not hard to understand why so many couples choose the island as the backdrop to their special day. Not only that, but it is incredibly easy to get married in Jamaica. Only 24 hours need to have passed between arriving and walking down the aisle, and many resort hotels offer wedding packages so you can enjoy your day with ease. Plus, you can immediately start enjoying your honeymoon from the minute you say ‘I Do’ with a wide range of romantic attractions. Here’s our guide to everything you need to know about getting married in Jamaica. Jamaica is home to a plethora of luxury, all-inclusive resorts – many of which offer incredible wedding packages. Here are just three of our favourites (that you can book through us). 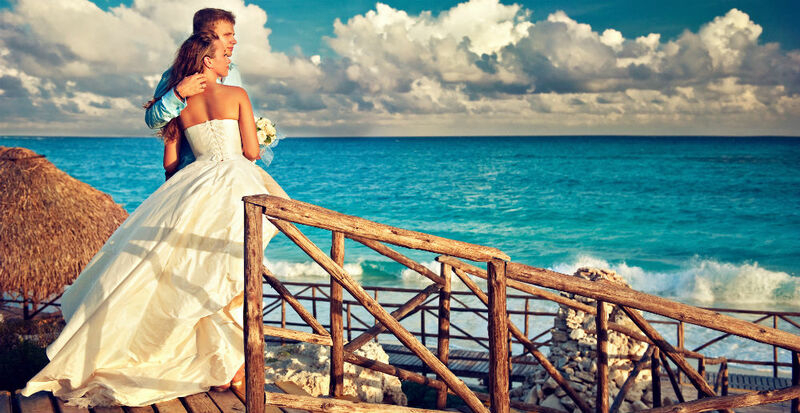 Sandals Resorts require no introduction, but did you know they also offer Free Weddings if you stay three nights or more? This includes preparation of wedding documents, a manicure for the bride, a ceremony location, unlimited guest seating, a bouquet, pre-recorded musical accompaniment of your choice, wedding cake, and reception. Not only that but if you stay 6 nights or longer you’ll receive $500 Wedding Credit to design your own dream wedding. If you’re looking for a modern resort that offers amenities to keep all members of your wedding party entertained, then look no further than Moon Palace. The resort is home to four swimming pools, a wave simulator, five restaurants, 24-hour coffee shop, and nightly entertainment. They also offer a Wedding Package that includes a wedding coordinator, a minister, a decorated ceremony location, bridal bouquet, single-tier wedding cake, sparkling wine, recorded music, free honeymoon package, and a wedding registry. If you’re, however, looking for something quiet and intimate we recommend Hyatt Zilara Rose Hall. This adult-only resort boasts swimming pools, beach butler service, two a la carte restaurants, and an incredible section of watersports. Their Wedding Package includes a wedding coordinator, wedding certificate, ceremony location, bridal bouquet, wedding cake, sparkling wine toast, an audio system for the ceremony, romantic dinner for the couple, and couples massage. It is, however, possible to organise a DIY wedding in Jamaica. The Jamaica Tourist Board has an entire section of their website dedicated to independent wedding suppliers. This includes Wedding Planners, Entertainment, Bakers & Caterers, Florists, Bridal Wear, and Photographers. Overall, the processing fee for the Marriage License is Four Thousand Jamaican Dollars (approximately US$50.00). The marriage license is valid for 3 months and the application is a same day process. If you have any other questions about getting married in Jamaica? Leave them in the comments and we’ll answer them for you. What island is your perfect honeymoon destination?